Our 2nd graders have loved sharing their thoughts and opinions about what the best picture books have been this year. We've talked lots about how the Caldecott Medal is awarded to the illustrator, and how we need to think about how the pictures add to the story above and beyond the words. We've talked about the color choices illustrators make, the way the convey emotions in characters' expressions, and the perspectives they use and how this brings readers into the picture books. Above all, they feel part of the process and are excited to find out the winners of the 2013 Caldecott Medal. Are you looking forward to it? Check out this website: ALA Youth Media Awards. You can also check into Facebook for the announcements on Monday morning. My students passionately discussed three more books today, declaring love and admiration for all three. They're convinced that the Caldecott Committee has a very hard job on their hands, comparing these different illustrations! Our second graders thought it was hilarious the way that the author and illustrator argued in this story. But more than that, they argued vociferously that the illustrations add to the humor and pizazz of this story. 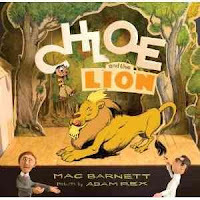 The love the combination of different media - with the puppet figures for Adam and Mac, the cartoon characters for Chloe, and the stage elements that give the story a 3-D feeling. They laughed at the way Adam's dragon is way-cooler than Mac's lion. And they loved the resolution at the end. This is a smart story that completely hooks its audience. 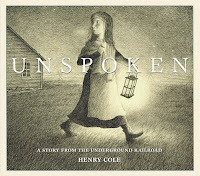 In many ways, it reminds me of Interrupting Chicken, a Caldecott honor book in 2011. This wordless book took our breath away when we read it. It's truly a book that makes you think at each step of the way, as you unravel and make sense of the story. As the pieces of the puzzle came together for my 2nd graders, they were amazed at the young girl's kindness and courage, and the runaway slave's daunting challenge escaping to freedom. We talk all the time about "reading is thinking" and Henry Cole asks his readers to do just this. On our first read, some of my students were frustrated that we never see the full face of the African American hiding in the corn stalks. But as we talked about it today, those same students talked about how much this story stayed with them. Cole's pencil drawings evoke the girl's emotions and the setting of Civil War Virginia, creating tension and mystery within this quiet book. It's a book that will stay with us for many years. 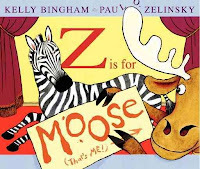 With giggles and pointing, our 2nd graders ate up every inch of Bingham and Zelinsky's mad romp in Z is for Moose. They loved the goofiness of the premise, but they also loved the heart of the story - declaring that this is really a friendship story in the end. We talked at length about how the illustrations add to the story. The love the chaos that ensues when Moose disrupts the story, but they also responded to the emotions in Moose's face as he felt left out from all the fun. Just look at Zebra's expression on the cover and you can tell the way Zelinsky adds tension through those angry eyes. Other children noticed the way the color frames contrast with the background and the stage. But mostly, our second graders just loved this silly, funny book and wanted to read it over and over again. We did not have an official Mock Caldecott vote with our second graders. Over five weeks, I read three classes different sets of books. Maybe next year I'll rotate a set amongst the classes, the way that Travis Jonkers did (see his post here). Whatever the case, the children really developed their ability to talk about picture books they love, support their ideas with clear reasoning, and share their love with other children. Many thanks to the publishers for supporting our Mock Caldecott unit: Disney / Hyperion, Harper Collins, and Scholastic. If you make a purchase using the Amazon links on this site, a small portion goes to Great Kid Books (at no cost to you!). Thank you for your support.